When I was 12 years old, my cousin Phil came by to show me his 1965 Corvette roadster and give me a ride. He stopped the car in the middle of the road, revved the motor and dropped the clutch … speed shifting through all 4 gears. That was the most exhilarating moment in my life up to then or at least the one that opened my eyes to the world of fast cars. It sure beat baseball. I endeavored to learn all about cars from that point on. The passion was stoked further when my older brother, Mike, came back from an Army tour in Korea and purchased a 1963 Porsche model 60 cabriolet. His later autocross ride-a-longs in it and a new 912 further embedded my desire to someday race. Eventually when my older sister, Bonnie, got her drivers license, my dad bought a 1967 Corvair 4-door automatic for her to drive and take me and the neighbor girls to school. 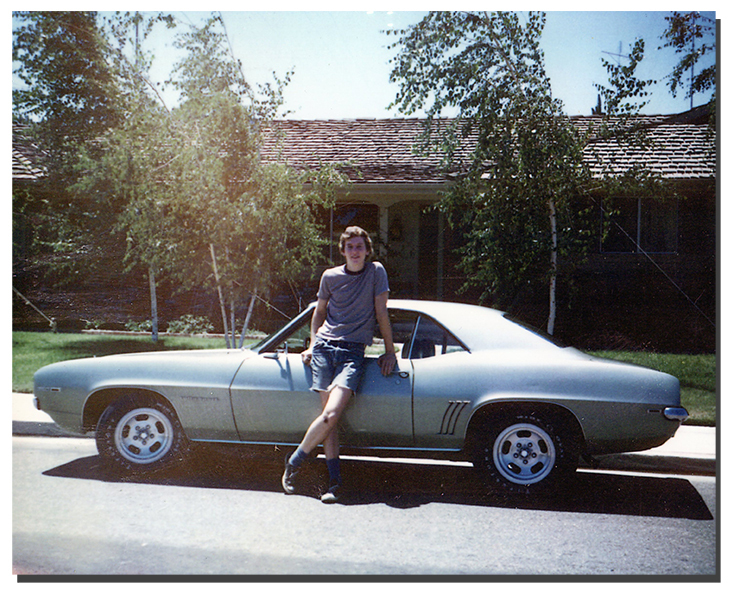 When I turned 16 a little over a year later, I got to become the designated driver and I quickly learned to slide the rear-engined Corvair around the corners. A 1969 Camaro RS350 came next, but even though I loved the power, we all know it wasn’t much of a handler. So I built my own 1965 Corvair Corsa 140 from two old chassis, and decided to autocross it myself at a few local events. About this time, I also started attending races at Laguna Seca and watched Mark Donohue crush the field in the 1973 season in his Porsche 917/30. I was so inspired by Donohue’s story; I decided to try and change my major to mechanical engineering and enrolled at Fresno State. I did this on a whim and actually decided only at the very last moment to go for it. I had no classes lined up and started off on my back foot and ultimately bombed out with college level chemistry, calculus, and physics proving my senior year in high school was spent goofing off way too much. Back into a business and accounting major for me and time to get serious about grades and a future. The idea of actually racing myself quickly faded into a dream. I graduated from college and started a career and that was that except for attending the odd race here and there. Fast forward almost 30 years and at age 50, my son, Aaron, and I were given a surprise gift to go to Skip Barber race driver’s school at Laguna Seca and the spark was rekindled. Aaron and I followed the initial outing with another 2-day advanced school...then my first Skip Barber race weekend. After another race weekend at Jim Russell school, the hook was firmly set and I began looking for a class to race in. A trip to Thunderhill to watch SCCA regional action led to an order for a new Spec Racer Ford. Then I quickly added Formula Enterprise to the mix and even a vintage sports racer, a 1973 KMW Porsche interseries car. Beginning in 2012, I started racing Norma brand sports racers exclusively. Starting with a model M20F and now the latest specification version of the M20FC, we've compiled an enviable record over the last few years. We hold the SCCA P1 track records at Thunderhill, Laguna Seca, Buttonwillow, Portland, Auto Club Speedway, Willow Springs, Sonoma Raceway, Mid-Ohio, and now Indianapolis Motor Speedway. 2014 highlights were winning the NORPAC championship, the San Francisco SCCA regional championship, 3rd at the National Runoffs, and winning 10 out of 20 events entered. 2015 had even more success by winning the NORPAC championship, the Western Conference Championship, and 2nd at the Daytona Runoffs. In addition, we won 12 out of 19 potential events entered. 2016 marked the start of my 10th full season of SCCA competition. We set an ambitious schedule and the season started well. As each pole and win piled up, we started to realize this season had the makings of something really special. And yes, as it turns out, it did. Other than two mechanical DNFs, we won every pole and every race entered, including the Runoffs. We also completed the Super Sweep...the most coveted prize in SCCA club racing. By the end of the season, we'd won an amazing 21 out of 23 races entered and the NORPAC championship, the Western Conference Championship, the San Francisco Regional Championship, and, most importantly, the National Super Tour Points Championship. In 2017, despite the rules being changed to cut our horsepower back significantly, we again had a dominating season but, unfortunately, came up short in the Runoffs at Indianapolis Motor Speedway after putting our Norma on pole. We were in position to complete another Super Sweep too, but it was just not meant to be. Still, we won our second consecutive National Super Tour Points Championship and the Western Conference title so the season was not all lost. This level of success is due to a combination of things, but the most important ingredient is having a well-prepared race car and for that I have to thank Jason Hohmann, owner of Bulldog Motorsport. Jason, and his right hand man, Chris Garcia, have gone above and beyond the call of duty and our success is a testament to their abilities. In 2018, we are going to run some additional cars and events. It is clear the SCCA rules makers are out to slow us down in P1 and put obstacles in our path. So even though the Runoffs are in our backyard at Sonoma Raceway, it is far from certain whether we will be competing in P1. Just getting the car in compliance with the new rules that affect only us will be a challenge. Instead, our main effort with the Norma will be running in the NASA National Championship in September at Circuit of the Americas.